William Shakespeare’s verse has long been an inspiration and source for many composers. 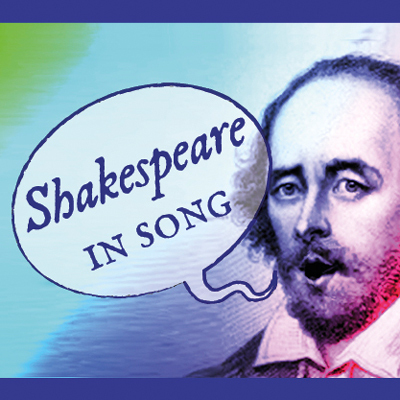 In celebration of the four- hundredth anniversary of his death, this concert features a selection of songs and music, setting lyrics drawn from the bard’s plays and sonnets, where the timeless beauty of his words is enhanced by song. The programme includes the choral version of Vaughan Williams’ Serenade to Music, which was dedicated to Sir Henry Wood. Its text is an adaptation of the discussion about music between the lovers Jessica and Lorenzo from the beginning of Act V of The Merchant of Venice. Declarations of love are juxtaposed with comparisons of the movement of heavenly bodies (the “music of the spheres”), while contemplating the beauty of music by night and by day. At its premiere in 1938, this exquisite and passionate setting moved Rachmaninov to tears. Other Vaughan Williams works being performed include Three Shakespeare Songs, with words drawn from The Tempest and A Midsummer Night’s Dream. These expressive miniatures for unaccompanied choir range from the eerie portrayal of underwater bells in Full Fathom Five to the nimble and flighty Over Hill, Over Dale. The programme also features two delightful groups of settings by composer, jazz pianist and swing-band leader George Shearing, who drew on Shakespeare’s sonnets for the words to his Music to Hear and Songs and Sonnets. Other Shakespeare songs by Jaakko Mäntyjärvi, E J Moeran, Anthony Milner are also included, as is Richard Rodney Bennett’s Full Fathom Five, another of the three very different versions of Ariel’s song in the programme. The performance is interspersed with Shakespearean readings by Rosemarie Partridge and Terry Prince of The Company of Ten, and is conducted by our Musical Director, John Gibbons.